If you run a home based business and you are in need of an office, a basement can serve as that perfect place to set up your office. All that is required is to furnish the basement. This can only be achieved if you have finished basement design already in place. Bring in your office furniture, and some essential office supplies and equipment including file cabins, a fax machine, photocopy machine, printers and telephone. Another great basement idea is to turn it into a small gym. Large spaces are not required for a treadmill. Same thing applies to the different sets of gym equipments you intend bringing into the gym as well – they all require little space. Your basement can also be converted to a place where your kids can enjoy lots of playful activities. In this case, you don’t need to furnish or beautify the space. However, you might want to consider having a removable rubber carpet on the floor. This is because Kids can be messy and erratic at times thus it is wise not to rule out the possibilities of accidents. Your basement can also be transformed to a private entertainment room. The lack of light in this part of this house makes the basement perfect to set up a mini theatre. Some homes utilize the dark corners of their basement as a mini theatre. 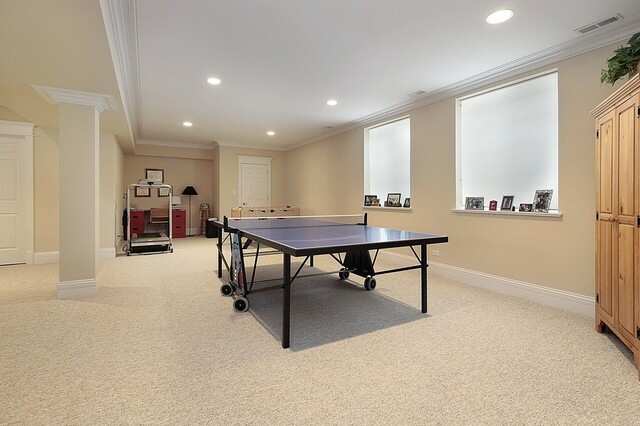 Not only is your finished basement design optimized, it comes with a whole new experience. Transforming your basement to a bar is another wonderful idea. Having a bar in your basement will solve your problem of thinking about where to hold your private parties, as well as relax with friends during the weekends and festive periods. The basement can come in handy for those with a large family and have used up all the spaces in the house. With proper planning and remodelling, the basement can solve the problem of extra rooms for guest. Your finished basement can be transformed into a guest room thus increasing the home’s living space. Have you ever imagined the thought of having a classic music studio right underneath your building? It’s cool right? You can turn your thoughts to reality by having a very creative plan on the remodelling of your basement. All you need to do to setup your music studio is to, have a good sound engineer fix all the required equipments and instruments. A music studio is very cheap and only requires a good sound insulation.